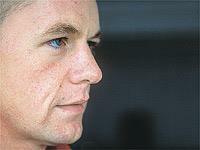 Chris Walker has partial paralysis of the face caused by a disease known as Bell’s Palsy. One of his eyes doesn’t blink, he can’t move his lips or swallow properly. He’s having to wear a patch over the affected eye. Obviously, if things don’t improve, Friday’s Valencia WSB test is off the agenda. But 50 per cent of sufferers make a swift and total recovery. Walker said: " It’s just another thing to add to the doom and gloom of the past year – I can’t believe this has happened like this.
" I only went to see a mate in hospital after a motocross crash and ended up being admitted and treated for this Bell’s Palsy thing. " The condition affects one in 5000 people. Walker added: " I have obviously spoken to the doctors a lot to try and find out as much as possible but they keep telling me there is not a lot they can do.
" I am taking every medication they are giving me to try and get this sorted out as soon as possible but I don’t think I am going to make it out to Spain for this test. This story was first released to MCN2U subscribers at 2pm on Monday, February 18, 2002. Want bike news to your mobile? Text MCN NEWS ON to 84004. At least five messages a week for £1 a week. Details? Click any MCN2U banner ad.